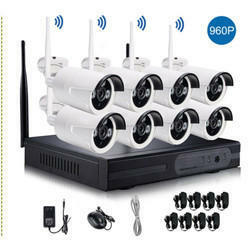 Pioneers in the industry, we offer 8 channel cctv surveillance system and 4 channel cctv surveillance system from India. Capture high-definition 960P HD video two times higher than 960P cameras. Each IP camera delivers 960p megapixel at 1280 x 960 pixels with sharper and larger image and video than 960p security cameras. Includes four digital wireless cameras with IR LEDs for best vibrant colour picture and night vision. Weatherproof CMOS colour cameras for the indoor and outdoor application. Widely used as CCTV system for the usage of the car park, office security and garden guard, etc.